Performance: The author narrates her own book probably from her house, the result is a poor echoing narration with too much oscillation in pitch. And we pay the same price of a high quality narration made in a proper studio, this shows that the author is cheap and selfish. She also promote herself in the entire book. Story: The book is not bad in itself but it's basically a compilation of her good readings she probably made throughout her life. So there's nothing from her own creation but a compilation of the good gurus out there, in that sense, it is better to go straight to the gurus rather than reading her books. The book is a self autobiography as well, and we can see she is a recovered doormat, in that sense, she gives good tips on how to say "no" in certain situations which in my opinion was the best part of the book as she exemplifies the situations and teaches the listeners how to say a collected 'no', but apart from this, there isn't much to add up. In my opinion, the other weak point in the book especially coming from someone in the psychology field was the reference of Oprah Winfrey, Kate Perry, Mandela and so forth as role models. I listen to this one and I have truly mixed feelings. I find very difficult to believe that this lady obtained Ph.D. in counselling, psychology or any other mental health profession. The professional vocabulary and knowledge is not there. This lady commits the basic mistakes that are described and corrected during the initial training of the mental health professionals. I perceive this book and the rest of " Dr. Lyn" publications, as books written by someone, who underwent counselling therapy and is in a process of sorting out her problems by writing the series of self-help books. There is nothing wrong with this approach (except the fact that she presents herself as a professional). These books are written with the great degree of naiveté; however, they are refreshing. They offer a common sense approach that appears quite sound. To "Dr.Lyn”: Ma'am, you are quite smart lady. You have a lot to offer for the average reader. Please do not stop writing. Stop pretending that you are someone else, stop the process of self-publishing and self-recording your books, start working with a professional editor, hire the professional narrator. You have a great message to pass around. I am sure that you will be able to reach much greater audience when you come across as being an authentic person with life experience and unique techniques that you are utilizing in combating your problems and setbacks. Best luck to you. 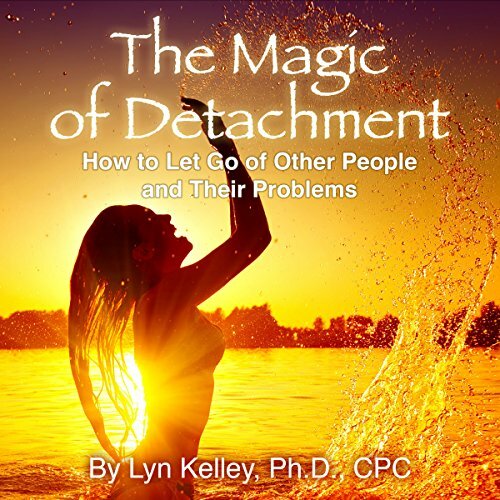 Would you listen to The Magic of Detachment again? Why? Yes and probably will too. The message is very comforting and takes a couple of times to take it all in. What didn’t you like about Lyn Kelley’s performance? I think it was the worst part of the experience. Her voice really isn't very good for this at all. Also there was some background noice at times. It really made me think about codependeny and the importance of finding my own bordres. Despite the reading I found this to be a very good book with a lot to think about! "The antidote to depression is Action." Loved the use of music lyrics as words to live by. Great perspective excellent real life examples. Very Empowering and meaningful. Insightful and guidance to really understand the meaning of self love and protection.